Swindon Town registered their fourth consecutive victory as they collected all three points at Shrewsbury. Anton Rodgers sent a free-kick over the bar and Ben Gladwin was denied three times from distance by Mark Halstead. 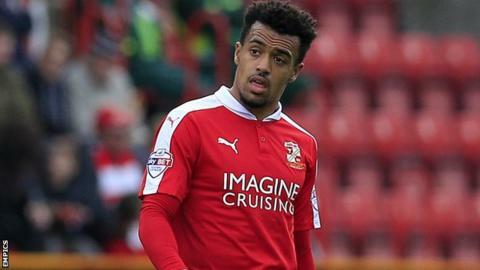 Nicky Ajose finally opened the scoring for Swindon as he turned in Rodgers' cross for his 10th goal of the season. Junior Brown and Scott Vernon went close to equalisers for the home side, but defeat meant that Shrewsbury slipped to 20th position in League One. "We didn't quite get going, we showed a bit more belief in the second half but we just didn't get onto the end of anything that was coming into the box. "We deserved to get a draw in the second half. Most of the game was played inside the Swindon half but we failed to have that bit of luck and good fortune to get in front of the goalkeeper. "I'm disappointed to concede - you have to pick bodies up, and two of them have come in at the back post unmarked and they have put the ball in the back of the net." Match ends, Shrewsbury Town 0, Swindon Town 1. Second Half ends, Shrewsbury Town 0, Swindon Town 1. Adam El-Abd (Swindon Town) wins a free kick in the attacking half. Foul by Jermaine Hylton (Swindon Town). Substitution, Swindon Town. Jermaine Hylton replaces Jonathan Obika. Corner, Swindon Town. Conceded by Nathaniel Knight-Percival. Anton Rodgers (Swindon Town) is shown the yellow card. Nicky Ajose (Swindon Town) wins a free kick on the right wing. Corner, Shrewsbury Town. Conceded by Raphael Rossi Branco. Corner, Shrewsbury Town. Conceded by James Brophy. Substitution, Shrewsbury Town. Shaun Whalley replaces Sullay Kaikai because of an injury. Delay in match Sullay Kaikai (Shrewsbury Town) because of an injury. Attempt missed. Sullay Kaikai (Shrewsbury Town) header from the left side of the six yard box is just a bit too high. Substitution, Shrewsbury Town. Tyrone Barnett replaces James Collins. Substitution, Shrewsbury Town. Liam McAlinden replaces Jordan Clark. Substitution, Swindon Town. James Brophy replaces Fabien Robert. Ben Gladwin (Swindon Town) is shown the yellow card. Jordan Clark (Shrewsbury Town) wins a free kick on the left wing. Attempt missed. Jonathan Obika (Swindon Town) left footed shot from outside the box is close, but misses to the left. Corner, Shrewsbury Town. Conceded by Adam El-Abd. Attempt missed. Junior Brown (Shrewsbury Town) left footed shot from a difficult angle and long range on the right is close, but misses the top left corner. Corner, Shrewsbury Town. Conceded by Anton Rodgers. Attempt blocked. Abu Ogogo (Shrewsbury Town) right footed shot from outside the box is blocked. Substitution, Swindon Town. Drissa Traoré replaces Louis Thompson.